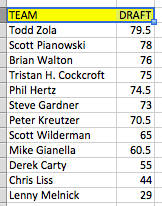 But in Tout Wars NL in 2013, Todd Zola did not take the crown, and Scott Pianowski wasn’t just behind him. Tristan Cockcroft did not finish fourth, and Mike Gianella did not finish ninth. In fact, Tristan Cockcroft finished first in Tout NL last year, for the second year in a row, and Mike Gianella finished second, his highest finish ever. Draft day is terribly important in rotisserie baseball, but as you will see below, a significant proportion of a league’s stats are added after the auction is over. Knowing how to manage them is an intrinsic part of winning the game, and has serious implications that resonate all the way back to draft day. By comparing the league’s final Hypotheticals with the actual final standings, we can take a look, category by category, at what teams bought in the auction and how much they added/shifted during the year. Looking at this list, sorted by the total runs teams had in 2013, we can see that Brian Walton bought 729 runs in the auction, then added 67 during the course of the year, which moved him from 11 Draft Points (DrPts) to 12 points in the category for the year. Notably, Pianowski added only 24 runs during the year, moving from first to third in the category. Lenny Melnick and I added more than 100 runs apiece and gained three points each, while Chris Liss added a similar amount but could not escape last. In all, the league increased it’s total runs by 10.69 percent. You can tell that my mission (and Melnick’s) was to add offense. He and I added the most homers and gained the most points in the category, while Phil Hertz got hurt as we passed him in the standings. The league as a whole added 9.29 percent home runs to its total. Kreutzer and Melnick again add offense, while Hertz is more surgical. Wilderman adds the most RBI, but fails to gain any points. The league adds 10 percent homers to its total. That seems to be similar from offensive category to category. Lenny adds some speed and scores big here. Again, about 10 percent of the category comes for free. BA is a bit harder to measure, since the interplay of AB and Hits makes a difference in two directions. No doubt there is something to be learned from looking at that more closely, but for now let’s just look at the actual batting averages. Here we see the price for adding all that production. Worse hitters drop batting averages by .003 points overall, though Lenny Melnick gains three points with just a .0018 bump. Lenny Melnick add 15.5 points in hitting last year, which helped his team, which was scheduled to earn just 29 points on draft day last year. I added 6.5 points. But neither of us landed in the money. The main takeaway is that over the course of the season there is available about 10 percent of each category available for free, and the cost for those stats is a little drop in batting average. Next up, we’ll take a look at how the pitching side measures up free lootwise, and what happens when you swap offense for pitching. This entry was posted in Data, FAAB, Free, Projections. Bookmark the permalink.